Top Tax Defenders is a tax resolution firm specializing in our clients' IRS tax problems. Our mission is to uphold and protect the rights of our clients. We promise to work hard and try to exceed our clients' expectations at every opportunity. Our goal is to help resolve our clients' IRS tax problems fast. We know that through hard work, perseverance, knowledge, experience and applying our proven methods will lead us to success. At Top Tax Defenders, we are dedicated to finding a solution to your back tax burden and give you back the peace of mind you deserve. Our staff of tax specialists has worked hard to achieve the best possible outcome for our clients over a wide range of back tax relief issues. We are here to help you and have successfully worked on Offers in Compromise, setting up long-term IRS payment plans, removed tax levies and liens, and business tax planning and preparations. We firmly believe that the most effective way to deal with a tax problem is to do so in an informed, and proactive manner. We offer the most practical and cost-effective paths to recovery. Top Tax Defenders provides aggressive, ethical tax help for all of your tax problems. Call today for a free confidential consultation with one of our tax specialist at 1-866-866-1555. Our staff is what makes Top Tax Defenders different from other tax resolution companies. We have experience working for the IRS as tax examiners, and counsels. This gives us an insider's perspective on how the IRS truly works and how we can effectively counter act their tactics. This unique insight allows us to know what the IRS will accept and reject, and this lets us serve our clients' best interest. We know how stressful and emotionally devastating it can be to face IRS debts, but rest assured that our highly experienced tax specialists will fight the IRS on your behalf. Our 27 years of experience in the tax business speaks for itself. Our staff has effectively dealt with a wide range of tax issues from removing tax liens, levies, negotiated countless offers in compromise, placing tax accounts in currently not collectible status, and setting up long-term payment plans. 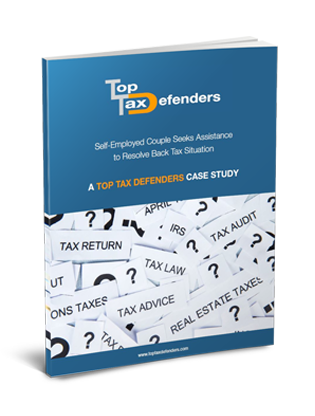 Learn how one couple worked with Top Tax Defenders and lowered their back taxes significantly.